We were contacted by Okanagan winery Misconduct in late 2017. They felt that they had outgrown their kitschy brand, and that the negative connotations of their name had become a potential liability in the #metoo era. They wanted to rebrand with a new name focusing on their sterwardship of their vineyards and attention to terroir. Our goal with the identity was to update the family crest with a more contemporary look and feel yet still paying homage to our clients’ roots. We wanted to simplify the crest to make it more legible at smaller sizes and for printing purposes. With a new name and terroir-first direction for the brand we invoked the heritage of the owner and wine-maker’s family name, borrowing heraldic elements of their family crest and introducing a Portuguese cross pattée pattern. We started by exploring different styles of lion rampants.We were inspired by the Lion Rampart adorning the Tower of the Castle of Barcience in Portugal. The lion is a common charge in heraldry. It traditionally symbolizes courage, nobility, royalty, strength, stateliness and valour, because historically it has been regarded as the “king of beasts”. The da Silva family crest features two lion rampants. Past iterations of the Suspect Series and Wine Club also featured different depictions of lion rampants. So far, the rebrand has elicited positive reaction from distributers, sales reps and customers alike. 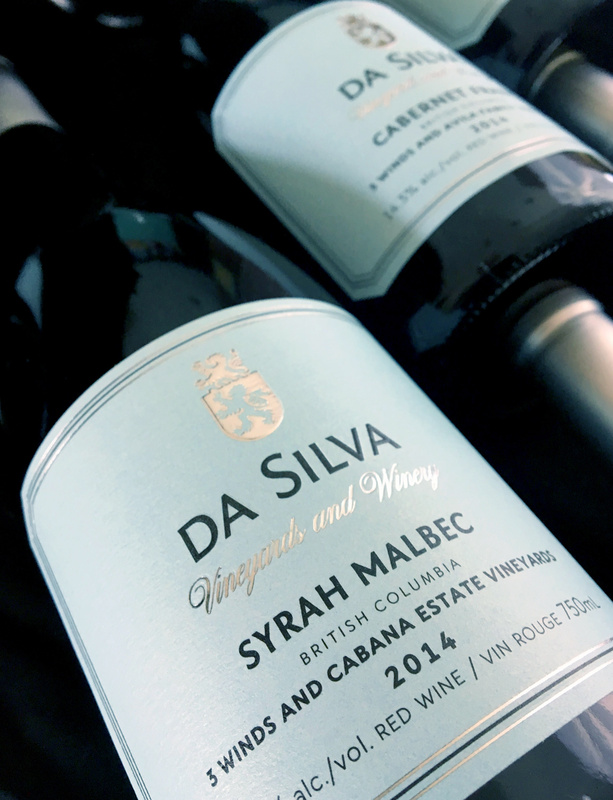 interest has been building throughout Canada and even across the pond where da Silva Vineyards & Winery unveiled their new look at the Canadian embassy in London, UK this spring. Along with new branding, signage and labels we were also responsible for providing da Silva Vineyards with marketing collateral including tasting note cards, pop-up displays, brochures and a new website. The goal for online and traditional deliverables was to funnel customers to the website’s new wine club to take advantage of the significant growth in monthly wine subscriptions. This not only creates a unique way to to engage existing customers and reciprocate their loyalty but also generates a steady revenue stream. Da Silva Vineyards & Winery now has the look and tools in place to expand their brand portfolio while they focus on their wines for the foreseeable future.